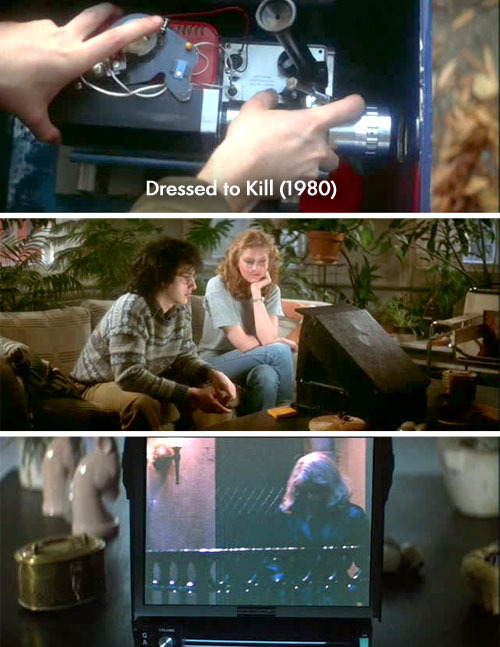 Just like in "Blow Out" Brian De Palma uses a movie camera to identify key actions in Dressed To Kill (1980). 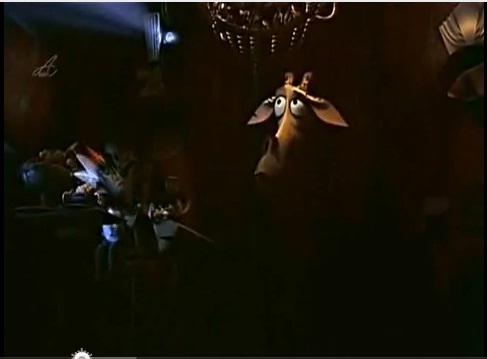 Does anybody know if the projector/viewer is real or just a movie invention? I can see a "GA" in the lower left of the unit...maybe for GAF? Anyone? Anyone? Well maybe it is a motorized editor/viewer. I have one myself but I don't see any arms on that one so I'm not so sure. I don't know about the viewer but the camera looks like it is using a SOM Berthiot Pan Cinor 30 lens. That's a D-mount lens for Regular 8mm cameras. I can't tell what type of camera it is though. I recognized the lens because I have the same one on my Bolex H8. 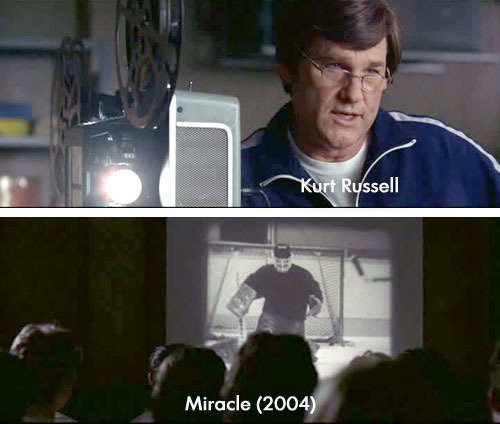 Looks like this may be another B & H "Green Monster" in Miracle (2004). My VHS tape was too dark to notice what model it was...if anyone has a DVD of the film, it's about twenty minutes into the movie! 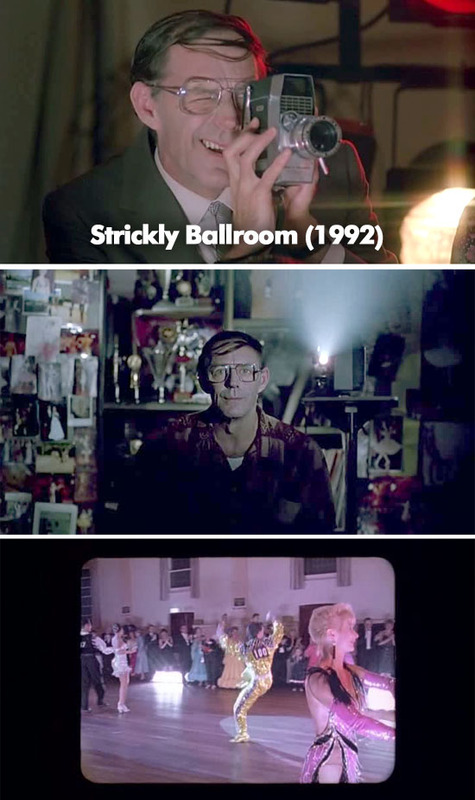 Ok Gerald here you go...I had Strickly Ballroom (1992), but I had a really tough time locating these screen captures. They were only on for a second or two. I'm still not sure what type of projector...maybe B&H?...or Singer as was mentioned in the previous movie. The camera might be easier to identify. 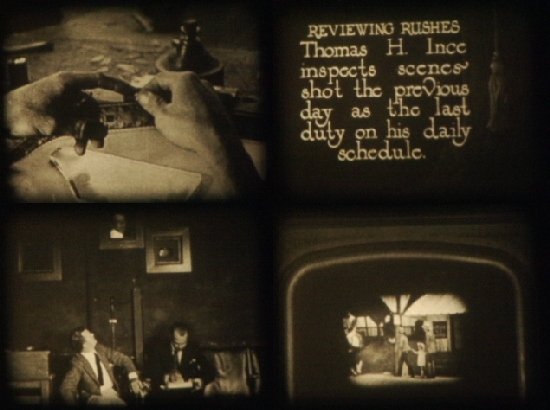 This shot was in the beginning sequence of the film. I have one of those cameras, it is a B&H 414 or 424....the Zapruder camera. 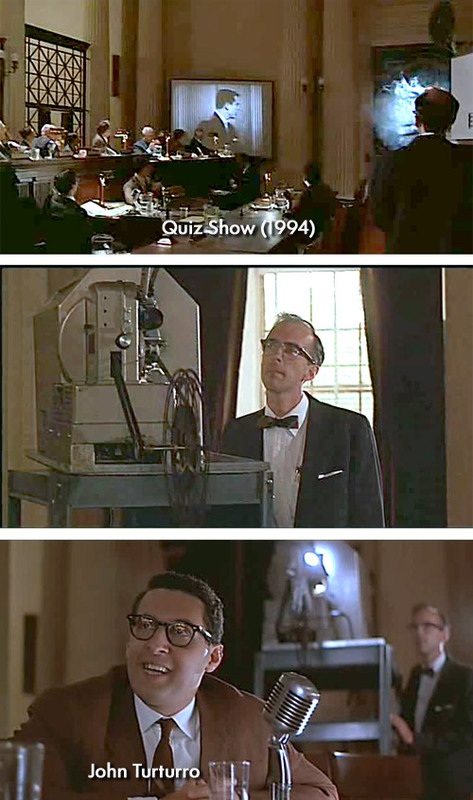 Quiz Show (1994) has a very interesting looking projector...nothing like I've seen before. Wow...that projector is a quite a tank, I wonder what it is too. P.S. The projectionist looks like the same one from Strictly Ballroom! Here's an image, the best I could get, from Madagascar: Escape 2 Africa. I don't think we have this. Either the picture is reversed, or it's a left-handed one. Back in 2010, Gary Crwford posted about this episode of Columbo called Forgotten Lady with guest star Janet Leigh. 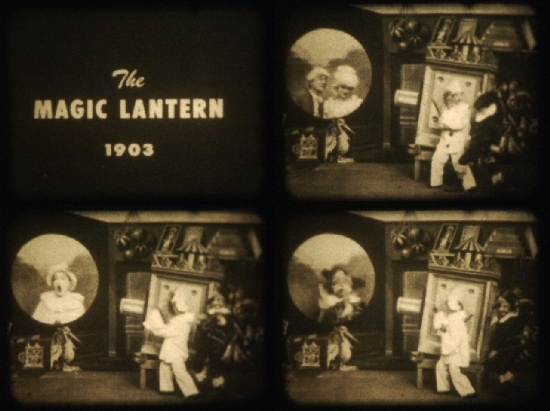 The clip shows her splicing together some broken 16mm film. I'm almost embarrassed to state this but my band has the closing song in a current D-grade horror movie called CHILLERAMAthat revolves around the closing of a drive-in movie theatre and quite a few scenes not only involve the projectors but lamenting about the physicality of film. Also there is an episode of a Horror anthology TV show that revolved around a horror film that makes people murderously mad and one guy threads his own intestines into the projector if i remember. I actualy thought CHILLERAMA was ok,I thought the Wadzilla episode was very funny but on the whole it was a very mixed bag indeed. 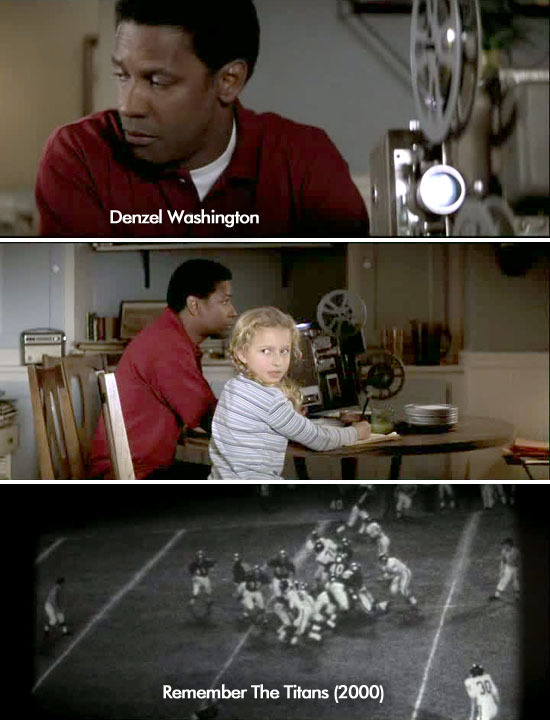 Remember The Titans (2000) starring Denzel Washington was based on a true story. This is a scene where Denzel is watching football films just before a rock or brick is thrown through his window. Dino's latest post made me remember about the beginning of True Romance, where Clarance is watching a martial arts film in a theater to celebrate his birthday. Again, I don't think you see a projector but, only it's light and some of the film on the screen. P.S. Janet Leigh working those rewinds = Awesome. This next movie The Best of Times (1986) was one of my two sons' favorite 80's movies. 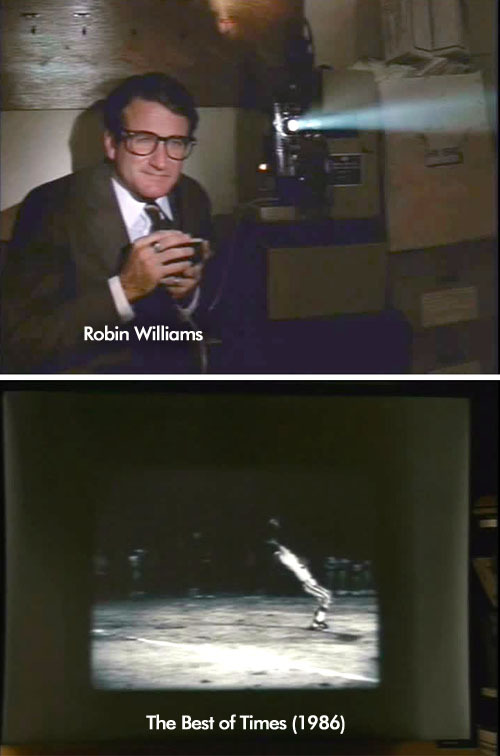 It starred Robin Williams and Kurt Russell who try and re-create the historical "big game" they lost in high school. It was filmed in the small town of Taft, California. Several of my Bay Area friends came from Taft. I thought I'd add one more movie to this thread before 2012 arrives...at least it's not yet New Year's in California at the time of this posting. 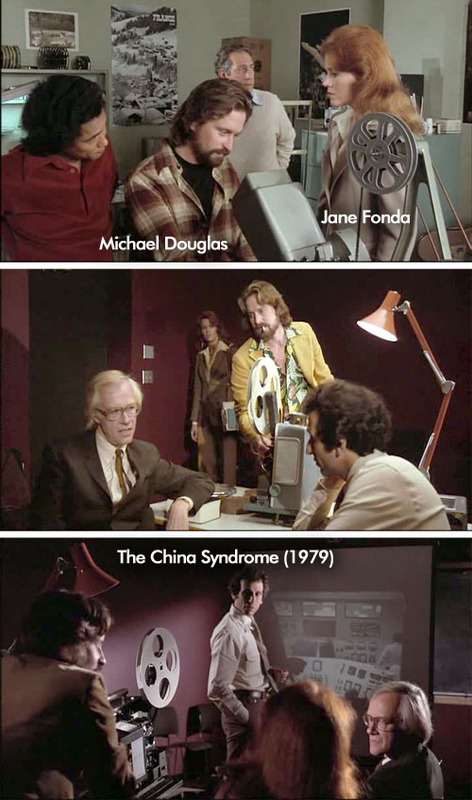 Here is some screen captures of projectors in The China Syndrome (1979). That's terrific. Love those upright Moviolas! Yes...Doug. They look pretty cool. I've never actually seen one. I'm guessing they work like a giant viewer/editor. In this case they were using it in a newsroom to screen footage ...Do you know any other ways moviolas were used?